We have all been enjoying lower gas prices the last 2 years, since oil started its gravity free fall plunge south of $100 per barrel in 2014, hitting the low price trough in January 2016 around $26 per barrel. But now some very notable and rare developments have occurred in the energy markets that threaten to shoot the price of gasoline up quite a bit in 2017. 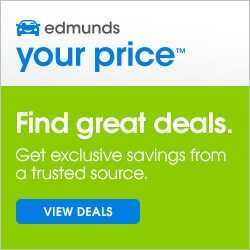 This could either give you cause for concern or an unlikely opportunity if you're buying a gas guzzling new SUV, minivan or pickup truck. While most people were busy trashing each other and un-friending each other on Facebook after the election, and with the distraction of the Thanksgiving and Christmas holidays, maybe many of you didn't notice the major news event that rocked the oil industry. 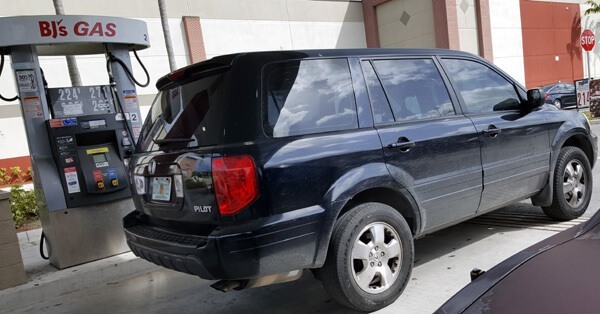 With the price of gasoline up $0.30 per gallon in the last 6 months anybody purchasing a large vehicle like an SUV, minivan or pickup truck should be closely following the price of oil and gasoline to determine if this is still a smart choice for you in terms of operating costs. Did you ever notice that when oil prices drop dramatically, it seems to take gasoline months to even budge downward, then it just goes down only a little bit. The owner of a 7-11 store near me told me that they negotiate gas contracts 3 months out, so oil can drop $50 per barrel today, and not budge the price of gas for many weeks afterward. But when oil prices move up, boy does gasoline sure start to soar northward in a hurry! It seems like the prices at the pump start to shoot up today before the newer higher priced oil that left the Middle East last week has a chance to arrive and become refined into gas. I snapped this photo below at the pump last week, where our price for regular gasoline was only $2.25. But months ago I paid as low as $1.94 at this very same pump. That's a 16% increase in the cost to fill your tank in just the last few months. For some people, the price of gas does not really overtly affect them, but for others it can be a budget buster. You don't normally notice this, but in big vehicles that guzzle down lots of gas and drive tons of miles, this can break your bank. 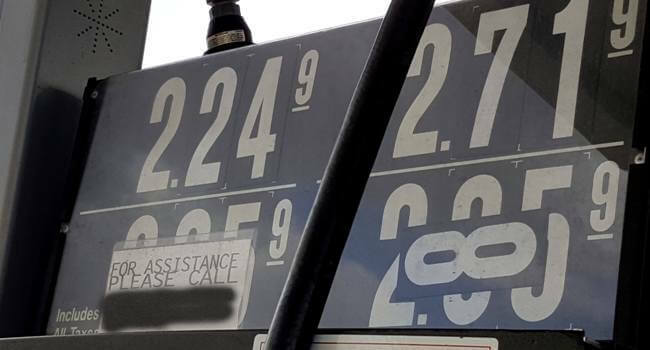 Even though gasoline prices have moved up in recent months, it is easy for people to get complacent and forget that low gas prices are always temporary and then it won't be long before they start shooting back up again breaking people's budgets. We have seen many cycles over the years where gas prices shoot up, then suddenly sales of SUVs and pickup trucks stall because they are gas guzzlers. Then car buyers shopping around go for the hybrids, electric and other economical cars. Right now, you can't give the Nissan Leaf away. The 2013 Leaf that sold for $30,000 new was fetching only $8,000 to $9,000 last year according to one bargain hunting buyer I talked to, losing an astounding about 75% of its value after only 3 years. No one cares when gas is cheap; if it was $5 per gallon, the Nissan Leaf would be selling for well over window sticker price. On the other side of the oil pricing cycle, when gasoline prices drop dramatically, you'll see the SUV and pickup truck sales pick back up again. Try to time your purchase to these higher price cycles if the higher price of gas does not bother you. Try to buy your gas guzzler vehicles when gasoline prices are peaking, and no one else wants them, and you're likely to see huge rebates from car makers eager to move this unsold inventory. I don't mind paying a bit more for gas, because if I can get an extra $2500 rebate due to soft SUV sales, that will more than pay for the extra gas hikes. The Organization of the Petroleum Exporting Countries (OPEC) has a large control of the flow of oil around the world, with 13 oil producing countries. Take a look at this oil price chart below from the last 12 months you can see I added the three events that I call OPEC false starts you see throughout 2016. During the last year, OPEC promised the world that their member nations were going to agree to cut back production of oil in order to relieve the worldwide glut which would drive the prices of oil back up. 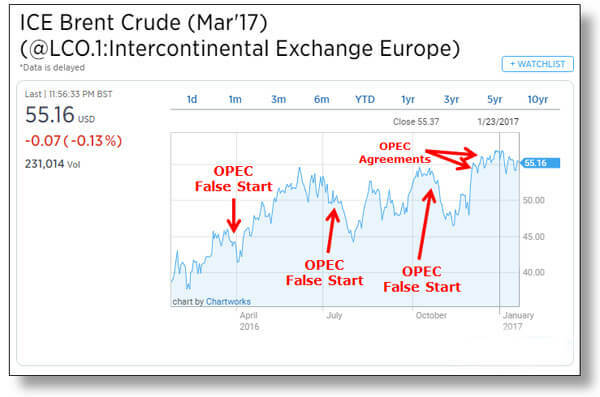 Of course oil investors fell sucker to it and believed it, thus speculating the price of oil up several occasions during the year. OPEC's claims of course turned out to be smoke and mirrors for the most part, and I suspect they were just bluffing to see if they could make the price of oil shoot up without having to do anything, and without cutting their daily production.The chart below shows in April, and in July and again at the end of September all three times where OPEC meetings failed to reach an agreement and so each time you'll see the price of oil dropped significantly. Then suddenly on November 30th OPEC surprised the world just like the Brexit vote did, with an agreement that nobody expected: 13 OPEC member nations agreed to reduce the amount of oil produced by 1.2 million barrels per day. Their hope is that with these minor reductions, the glut of stockpiled oil inventories worldwide will be used up, thus showing increasing demand, thus higher oil process. The above OPEC agreements exempted Libya because of the ISIS crisis they are facing, and also Iran, because they just came back online to the oil market after UN sanctions were lifted, so they are starving for income. Well OPEC's strategy worked, because oil shot up 20% in a matter of days; and if that wasn't enough, on December 12th OPEC was able to convince several non-OPEC nations to reduce their output as well. This includes for example Russia, Mexico, Oman, and Azerbaijan who collectively agreed to reduce output by 558,000 barrels per day. This fell somewhat short of the hopeful/futile target of 600,000 bpd that many were hoping for but at least this is the largest non-OPEC contribution ever. How high could gas prices get? In 2013 gasoline prices peaked at $3.75 so if OPEC can clear out this worldwide glut and get demand to pick up a bit, you could see prices at the pump back up over $3.00 again. At one point last year there were too many tankers floating on the ocean with and nowhere to go. Oil producers had tankers take the long way around, waiting on the ocean until buyers were found for the cargo. Assume you'll drive 15,000 miles per year. Assume your vehicle gets 15 miles per gallon. So take (miles/year) and divide by (miles/gallon), and using dimensional analysis, you arrive at your number of gallons of gas used for the year, in this case 15,000/15 = 1,000 gallons. If your gasoline usage is 1,000 gallons for the year, then at the current price of $2.25 you'll spend $2,250 per year on gas. If the price of gasoline shoots back to $3.75, you'll spend $3,750 per year in gas. Since last November 30th you have seen oil floating higher in price because of the perceived amount of reduced worldwide glut of oil that will occur and the industry perception of increased demand which drives the price up. What market conditions might make oil prices drop? A number of factors can make oil drop in value, for example a warmer than normal winter month, where people up north don't buy as much heating oil. That lack of demand causes stockpiles of oil to pile up, driving down the price. Oil industry analysts predict that oil can reach $70 this year from $55 now, provided OPEC nations hold up their end of the agreement and don't cheat which they have a history of doing. If OPEC cheats and the world is watching, you will see oil plummet again because now investors know that there's more Supply than demand. Also, Russia's promise of limiting oil production seems like a scam to me, since they have an asterisk with their promise. They are only reducing their monthly oil production from the November, 2016 levels, which were at a historical high, they had been ramping it up quickly over the previous months, most likely to give the impression of steep drops in production. That's a joke. The oil industry was quite surprised in 2016 that the fracking producers such as Continental Resources proved to be a lot more resilient than anyone thought when prices dropped to $26 per barrel. Sure, some companies folded, or shut down wells and laid off thousands of employees, but with fracking technology, their wells last longer, are much more efficient, are producing much more oil than anyone ever expected, and thus reducing their capital costs. It turns out the experts think the U.S. oil fracking companies can make money all the way down to $20 per barrel, they can just shut down their horizontal fracking wells, and turn them back on easily when the prices goes back up a bit. I think the U.S. oil producers will pick up the slack from the gaping hole left by OPEC, which might actually prevent the glut of worldwide oil inventories from diminishing. In other words, this whole OPEC ploy could turn out to be a wash.
What could make oil prices go up? Our world is approaching entropy and it takes very little these days to cause oil prices to spike, not just float up, but really start soaring as speculators pile on. Just last year alone, from April to July, Canada had the worst wildfire in history, that did not touch their Ft. McMurray oil fields, but they did have to evacuate for a month. You can see on our oil price chart above that oil shot up from $42 to $55 per barrel during this time, along with rumors of OPEC production reduction talks. If the inventory of oil stockpiles at the Cushing, Oklahoma storage facility drop, then oil prices go up. Cushing is a massive trading hub for crude oil, a market of sorts to determine pricing for West Texas Intermediate oil. Last year terrorist rebels were attacking oil companies in Nigeria for ransom, causing oil to spike also during the same time frame above. Another BP type disaster or other major pipeline burst could cause oil prices to float higher. A simple strike at any oil company like the strikes that occurred in Brazil and Netherlands last year caused oil to spike. If the Baker Hughes North American rig count released every Friday drops, meaning rigs were taken offline, oil prices increase because it means a higher chance for an oil stockpile drawdown, and thus higher prices. Lastly if the U.S. dollar falls against a back drop of other currencies, U.S. American oil prices known as WTI (West Texas Intermediate) rise because it costs foreign buyers of our oil less to convert their currency to ours to buy the oil. Conversely, if the dollar rises in value, then U.S. oil drops in value, because foreign investors have to spend more of their money to convert their currency to U.S. dollars, so U.S. oil costs them more money. There are a million things in this world that can control oil prices, launching them into orbit, or sinking them fast like a rock. One strategy I recommend for you is to try to get the most economical engine for your new vehicle to help protect you from rising fuel prices. Stay aware of the market to help determine if now is the best time for you to buy an SUV, or a pickup truck or minivan. Recapping our strategy, waiting until oil prices are high might also get you extra incentives or rebates on your new gas guzzler truck. You almost have to be the Oracle of Omaha himself, Warren Buffet to read the market to see what direction it is moving in. But if you can recognize signs of geopolitical strife in the international world, and wait for a spike in gas prices, you might just get a discounted new vehicle. Then after you buy it, pray for falling gas prices again. How much do you spend every year on gas? Let us know. A lifelong consumer advocate with over 20 years of unparalleled expertise, Jeff is the Founder, CEO and Editor-In-Chief of CarBuyingTips.com. As chief consumer advocate, he oversees a team of experts who cover all aspects of buying and selling new and used cars including leasing and financing. For decades, Jeff has been the recognized authority on vehicle purchasing, sought out often by the media for his decades of experience and commentary, for live call-in business radio talk shows and is cited often by the press for his expertise in savvy car shopping methods and preventing consumer scams and online fraud. Jeff has been quoted in: CNN, MSNBC, Forbes, New York Times, Consumer Reports, Wall Street Journal and many more. Jeff also has extensive experience and expertise in new car brokering and selling used cars for clients on eBay and Craigslist. Connect with Jeff via Email or on Twitter.